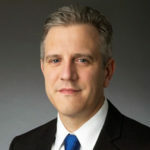 Chris Fonzone is a Non-Resident Senior Fellow at the Reiss Center on Law and Security at NYU School of Law and a partner in Sidley’s Privacy and Cybersecurity group. His practice focuses on a wide range of issues related to information technology and cybersecurity, and Chris also has particular experience in assisting in the management of crisis situations and advising senior clients on a variety of national security issues, including military and intelligence operations, litigation and other forms of dispute resolution, encryption, foreign trade sanctions, and Committee on Foreign Investment in the United States (CFIUS) matters. Before joining Sidley, Chris was Deputy Assistant and Deputy Counsel to President Obama and the Legal Adviser to the National Security Council (NSC). While there, he served as legal adviser and counselor to the President, the National Security Advisor, the Homeland Security Adviser, and other senior White House officials on the full range of matters before the NSC. Before his time in the White House, Fonzone was Senior Counsel to General Counsel of the Department of Defense, where he provided counsel on military operations and litigation matters as part of the General Counsel’s front office. Chris has also served in the Department of Justice, both in the Office of Legal Counsel and on the Civil Division’s Appellate Staff. Fonzone has lectured and taught classes on national security law at a variety of law schools, and his writing on national security topics has been published in a variety of forums, including the Washington Post, Newsweek, Lawfare, and Just Security. He also writes frequently on privacy and cybersecurity topics, with his work often featured on the Sidley Blog Data Matters: Cybersecurity, Privacy, Data Protection, Internet Law and Policy.